As technology is progressing it is affecting us all more and more every day and it does also affect helicopters. The industry has evolved in many areas starting with one of the more obvious things – going from analogue to digital screens. At first glance it is clear to see that screen (called the EPM, Electronic Pilot Monitor) is taking a fairly big part of the instrument panel and it displays representations of engine gauges, fuel gauges, and other various dials. There are many reasons why these screens are becoming more and more common in cockpits both in helicopters and airplanes. For starters, you can get more information on the same screen. For example when you start up the Cabri you are presented with a flight log screen and furthermore a test screen that tells you about previous flights such as fuel information and flight times. A quick look at the fuel gauge in the Cabri, on the right side of the EPM quickly tells us that we have 52 litres left and since the number is already in the system, the computer can combine this information with our current fuel flow and give us an estimated flight-endurance. Compare this to the analogue fuel instruments in the R22 where you have a gauge with a needle to represent what the quantity is. 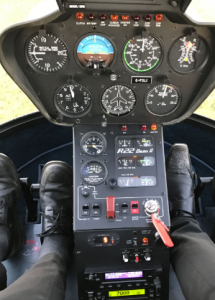 It is much harder to decipher exactly how many gallons you have left – “Is it 15 gallons or is it 16 gallons?” We can extract so much information from the Cabri system within a much smaller space on the instrument panel and so it is easy to see its advantages. The technology continues to evolve – if we compare it to your smart-phone then you will know that once in a while you have to download an update that has improved certain things on the phone to help the way it functions. 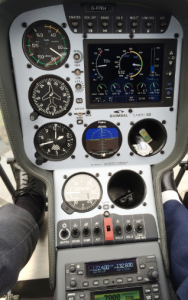 Recently the Cabri got a software update as well; it changed the power gauge, (also referred to as the MLI – Multi Limit Indicator) on the EPM so that it is possible to use a little more power in certain phases of flight i.e take-off. This was done purely on a software update and of course agreed with the engine manufacturer. There were not any instruments that had to be pulled out and replaced by a newer version; simply just software. I think that there is clearly a lot of benefit for the industry by moving in this direction as long as we are aware of its limitations too. A reliance on technology is not always a good thing, especially when things don’t go as planned, but moving towards having more accurate readings with more information is definitely a very positive thing.